Faerie is crumbling. When the queen of Faerie closed the gates between Faerie and the mortal realm, a blight on the land began. Now, the fae are turning into twisted versions of themselves as magic is going wrong or vanishing entirely. Twin daughters of a fae lord and the human ambassador to Faerie, Igraine and Iliesa just want to reunite with their parents and go home to Faerie. But the queen believes that only they can put things right—by becoming a willing sacrifice at Midwinter. The queen has their parents and all the power of Faerie on her side. The twins have their aunt Morgan, the former assassin Rowan, and the young human spellcaster Javier. As the clock ticks down to Midwinter, the twins discover unsuspected links to the land. But when Iliesa tries a desperate spell, she turns the blight onto herself. 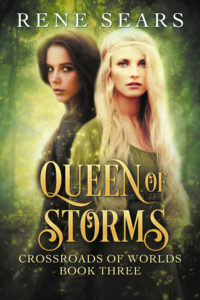 Bereft of her sister for the first time in her life, Igraine must turn to powers beyond Faerie or Earth for any hope of saving her sister and her homeland. Even if she succeeds, will she recognize what she’s become?